If you’re looking for a new way to get around the Lee Summit, North Town, Overland Park, Mission, and Olathe areas, you have a lot of options to choose from. If you’re looking for a family car that has all the performance and interior space you need, a station wagon might be your best bet. And though that class has a lot of options to choose from, one tends to stand out: the new 2018 Volkswagen Golf Alltrack. The VW Golf Alltrack is a prime example of everything a high-end station wagon can be. With all the performance and technology features you could want, this vehicle is a great fit for a wide variety of drivers. See everything it can offer in our comprehensive 2018 Volkswagen Golf Alltrack Review. 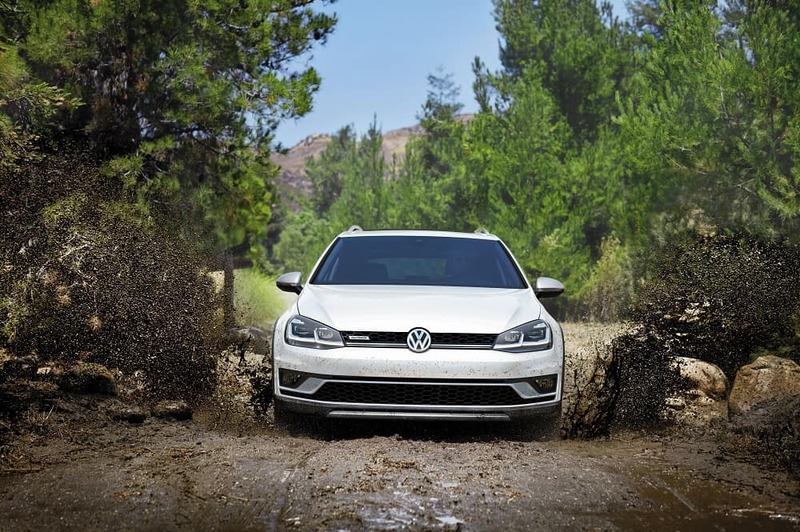 You may not think of performance when you think of what a station wagon can offer, but the new VW Golf Alltrack may surprise you. It comes with a 1.8L turbo 4-cylinder engine that produces up to 170 horsepower and 199 lb-ft of torque. Available with a 6-speed manual transmission or paddle shifters, you can take control of all that power more easily than ever before. That’s just the beginning, however. Whether you choose a manual or an automatic transmission, you can enjoy the advanced 4MOTION® all-wheel drive system. This system will automatically shift torque to your front or rear wheels, depending on what your situation calls for. Couple that with the available hill-descent control and off-road mode, and you can perform quite well traveling off the beaten path. Inside the Volkswagen Golf Alltrack interior, you’ll find plenty of room for passengers and cargo alike. Behind the wheel, you can enjoy a spacious 38.6 inches of headroom and 41.2 inches of legroom. Your rear passengers have plenty of space, as well, with the same amount of headroom and 35.6 inches of legroom in the rear. If you’re more interested in carrying around cargo, don’t fret, because you can fold the rear seats down to reveal an incredible 66.5 cubic feet of cargo space. Don’t hesitate to take advantage of this capability, either—the rear seats are equipped with easy-to-use release levers, so adjusting your seat layout is easier than ever before. Whether you plan on venturing off-road or staying firmly on the pavement, safety is the most important factor of any vehicle. Fortunately, the VW Golf Alltrack was designed from the beginning to be safe. Its advanced construction earned the 5-Star Overall Safety Rating from the National Highway Traffic Safety Administration. Arguably the most impressive safety feature is the intelligent crash response system, which automatically turns off the fuel pump, unlocks the doors, and activates the hazard lights when a collision is detected. There’s even an automatic post-collision braking system that makes sure you don’t roll away after a crash and become involved in additional impacts. Our 2018 Volkswagen Golf Alltrack review presents just a taste of everything this incredible vehicle can offer. If you want to learn more, it’s best to see it for yourself. At Volkswagen Lee's Summit, you can. Our knowledgeable team members know the new VW Golf Alltrack inside and out, and can help you determine if it’s right for you. Visit us or contact us online to schedule your test drive today!